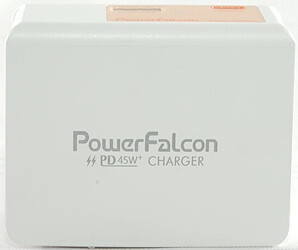 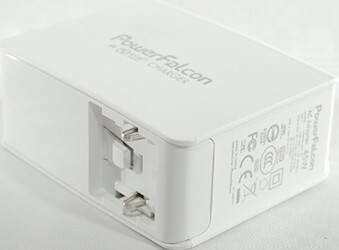 The charger arrived in a box with specifications and photos of the charger. 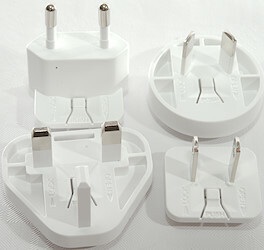 The box contained the charger and four different mains plugs, but no instruction sheet. 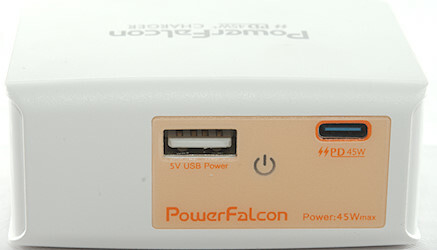 Normal USB is auto code with Apple 2.4A and DCP. USB-C PD have 5V 3A, 9V 3A, 12V 3A, 15V 3A, 20V 2.25A. 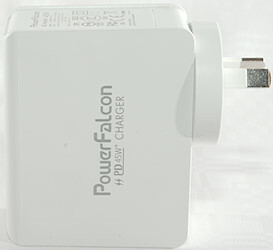 USB-C also has a DCP, Apple 2.4A and QC3 coding, it is also supposed to support FCP & QC4, but I did not detect it. 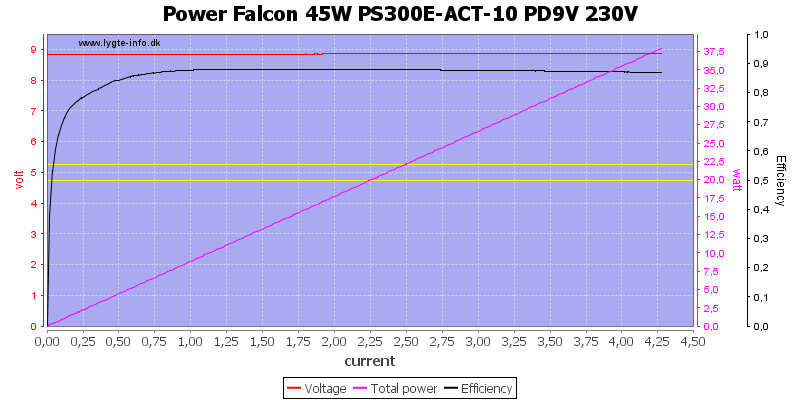 Power consumption when idle is 0.07 watt. 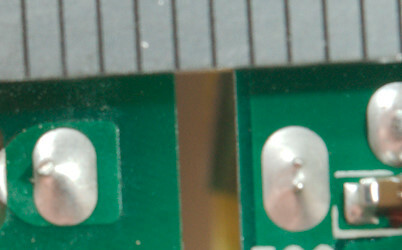 Behind the power switch symbol is a green led (It is not a switch). 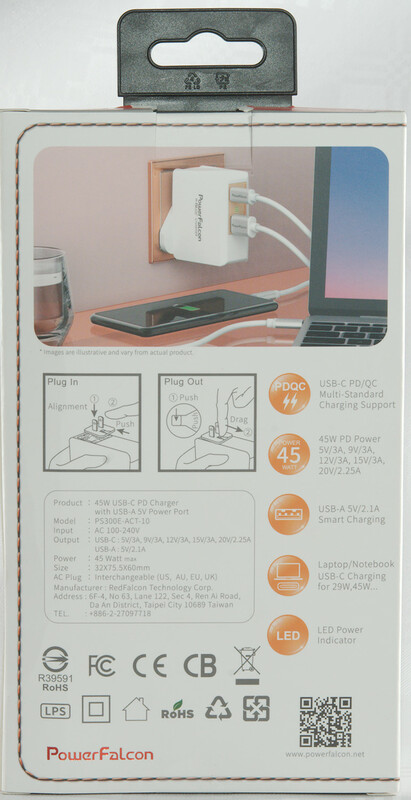 Default USB-C output is off. 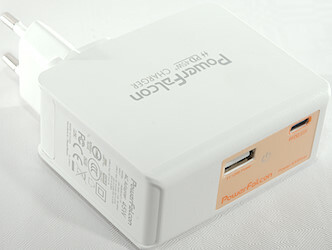 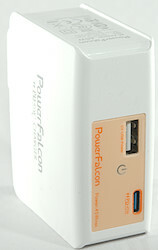 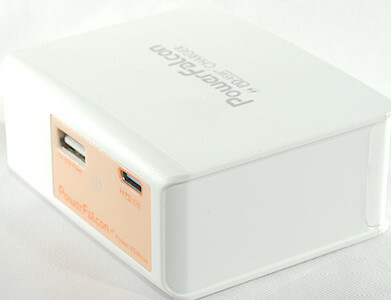 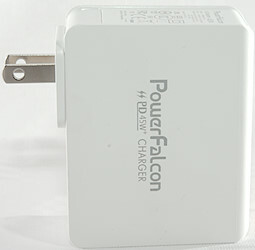 Size: 75.3 × 60.0 × 32.0 mm without plug. 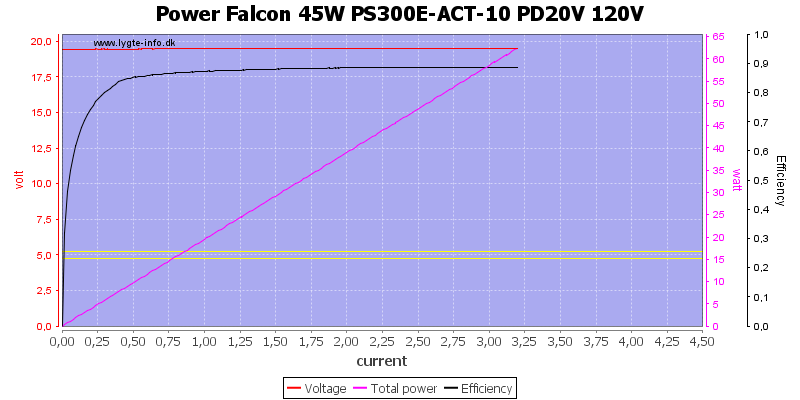 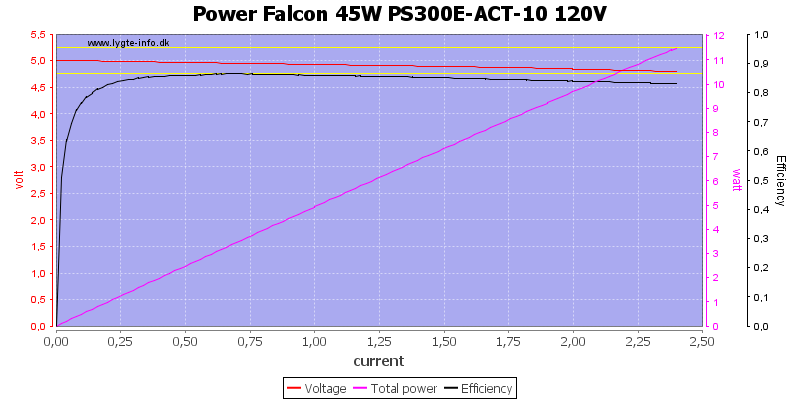 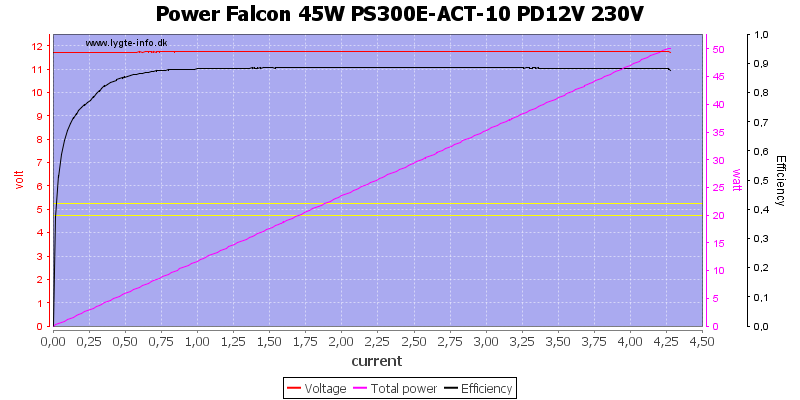 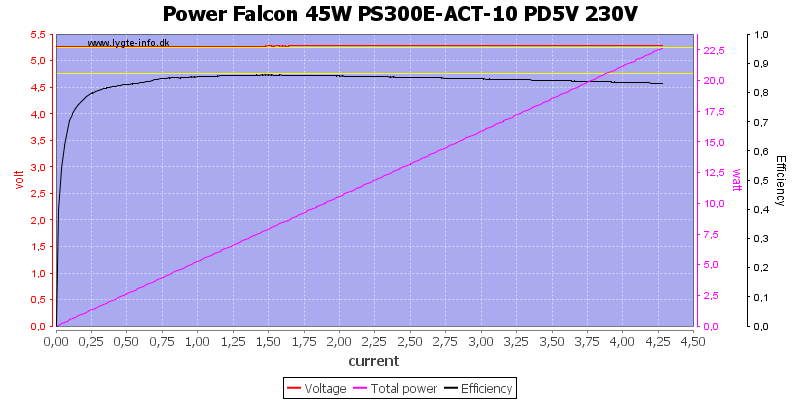 PD can deliver about 4.2A at 5V, this is a bit much for a 3A rated output. 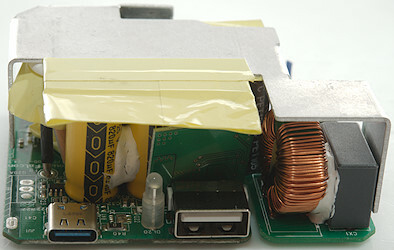 Here I did a one hour run at 5V 2.1A and 15V 3A, this worked fine. 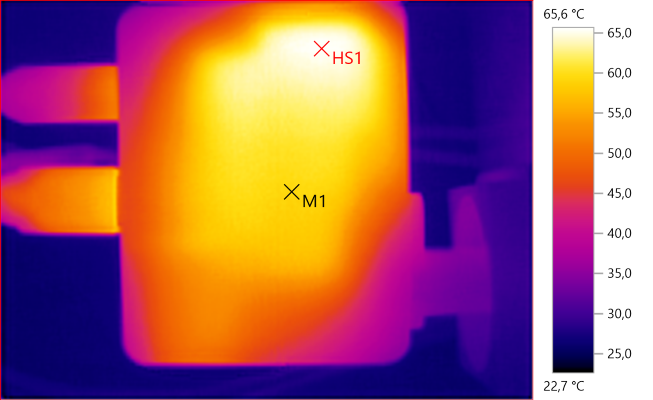 HS1 is from the heatsink. 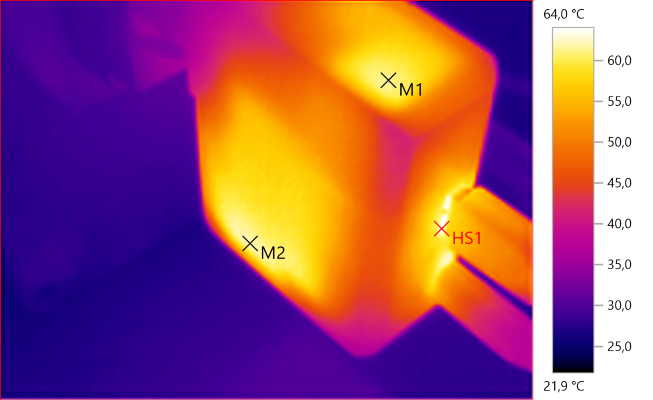 HS1 is the transformer, M1 is the snubber network and M2 is the rectifier transistor. 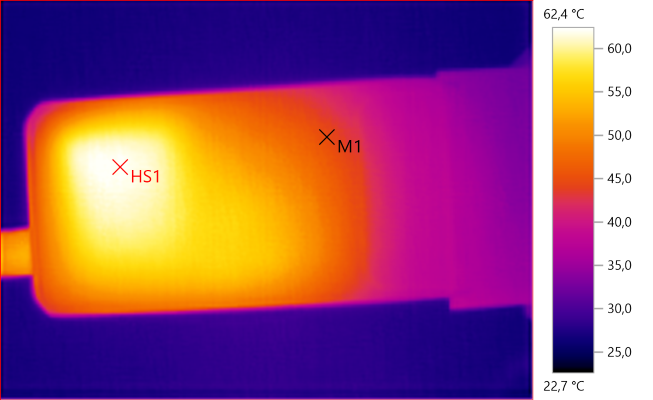 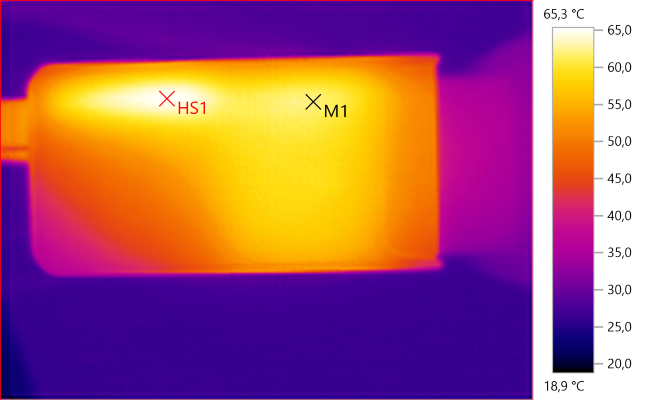 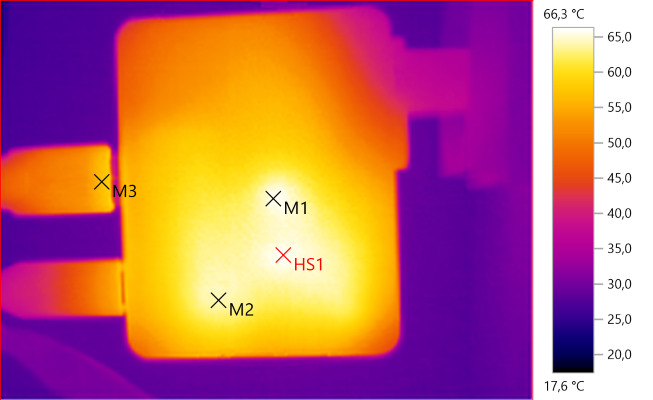 Both M1 and HS1 is the transformer, the large area is due to the heatsink. 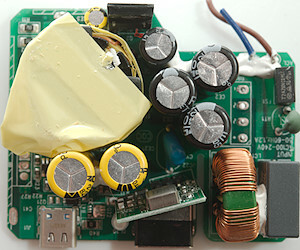 At 5V 0.5A the noise is 17mV rms and 282mVpp. 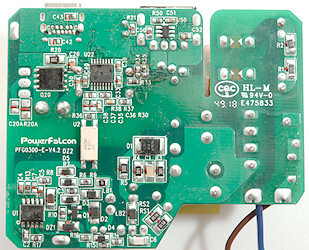 At 5V 1A the noise is 14mV rms and 209mVpp. 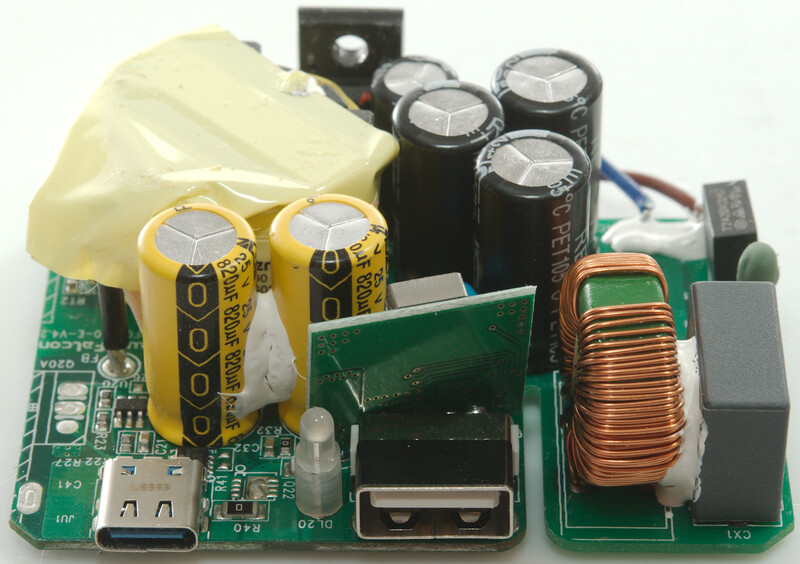 At 5V 2A the noise is 8mV rms and 214mVpp. At 5V 0.5A the noise is 25mV rms and 640mVpp. 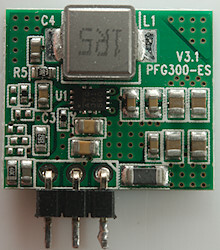 At 5V 2.5A the noise is 31mV rms and 516mVpp. At 12V 2.4A the noise is 17mV rms and 613mVpp. At 20V 2A the noise is 43mV rms and 428mVpp. I cracked most of the glue by whacking at the end of the bottom with a mallet and metal rod to direct the force, then used a screwdriver to break the bottom off. 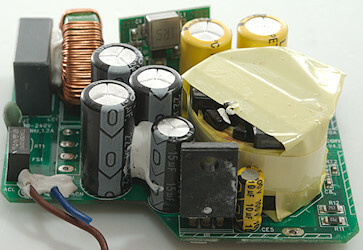 Most of the top is a large heatsink, but a fuse (FS1), a inrush current limiter (RT) and a bridge rectifier (DB1) is visible in the corner where the mains leads are connected. To see below the heatsink I removed one screw, the other was not accessible and I desoldered the bridge rectifier instead. 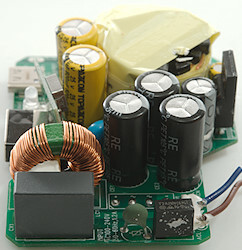 Near the missing bridge rectifier is the common mode coil (LC1). 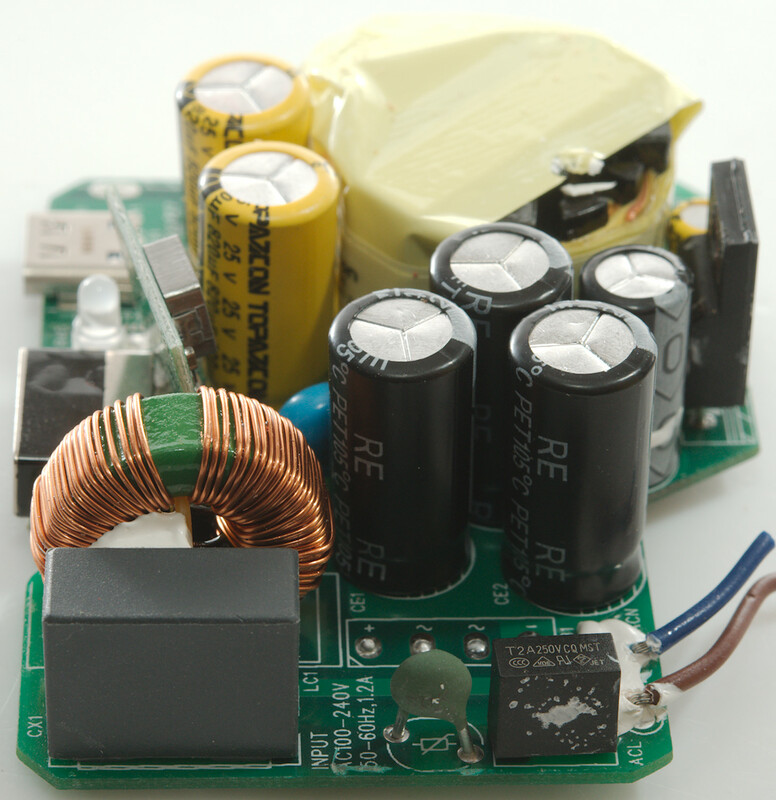 There is a safety capacitor (CY). 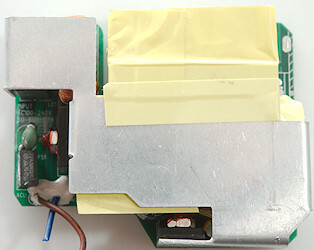 The mains switcher transistor (Q2) is at the top and was screwed to the heatsink. 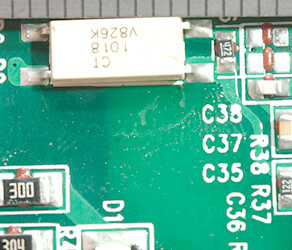 On the low volt side is a 6 pin chip (U20: Marked IAZEJ), it must be a synchronous rectifier controller and just behind the USB-C connector is a power mos (Q21: SPP8637 P-channel), probably for on/off control. 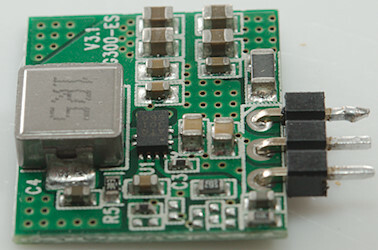 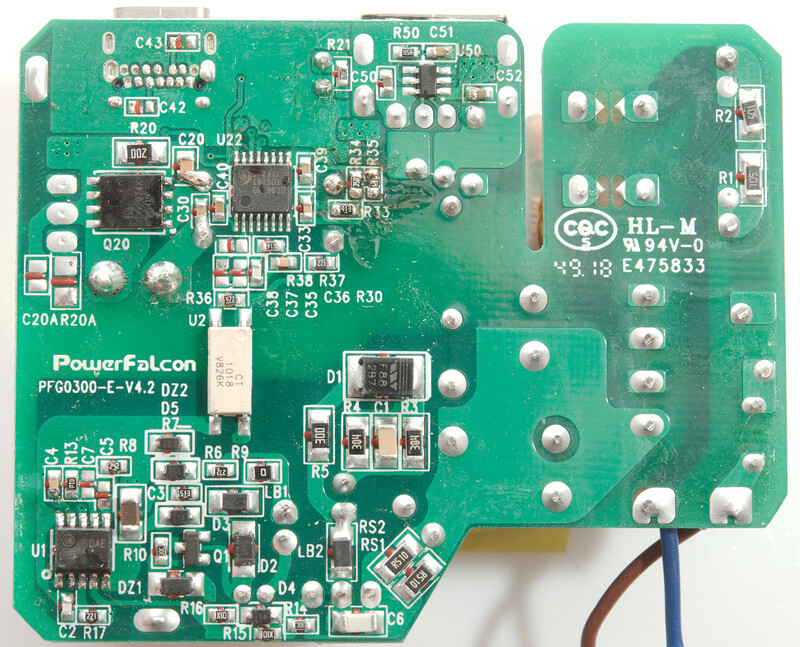 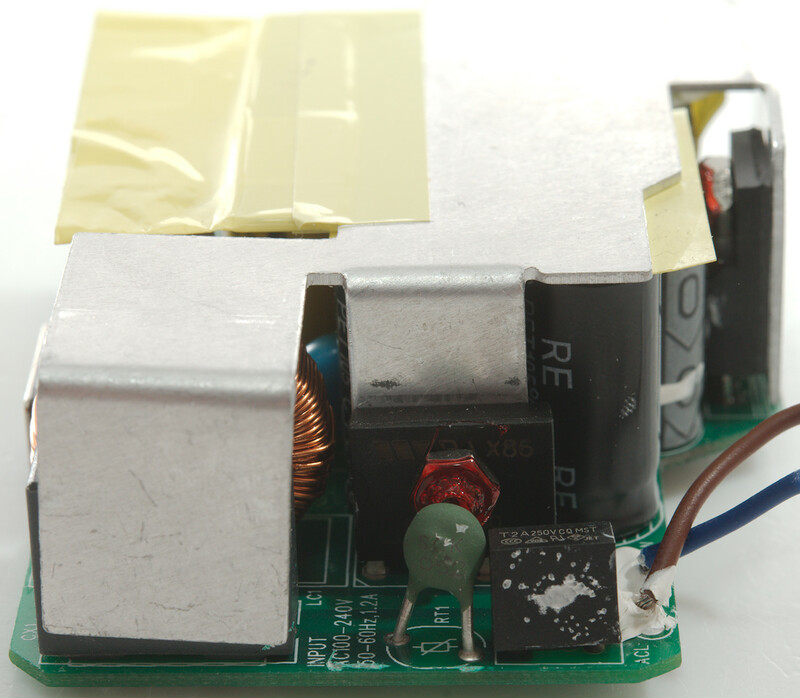 The standard USB output do not have a separate transformer, instead it has a buck converter on a small module. 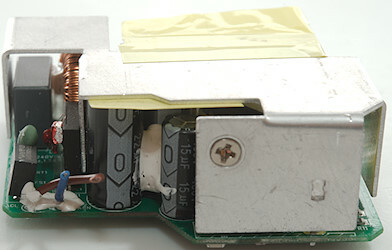 The buck converter module in place. 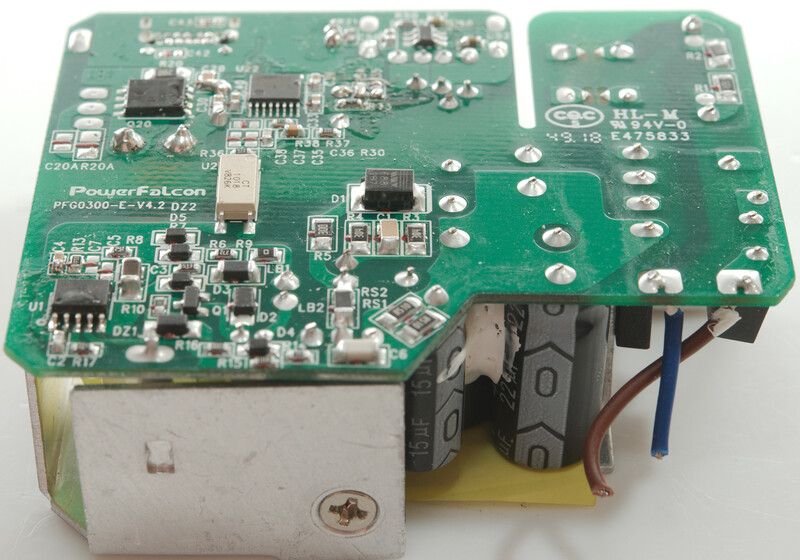 On this side is the mains switcher controller (U1) and a very long opto coupler (DZ2) for feedback. 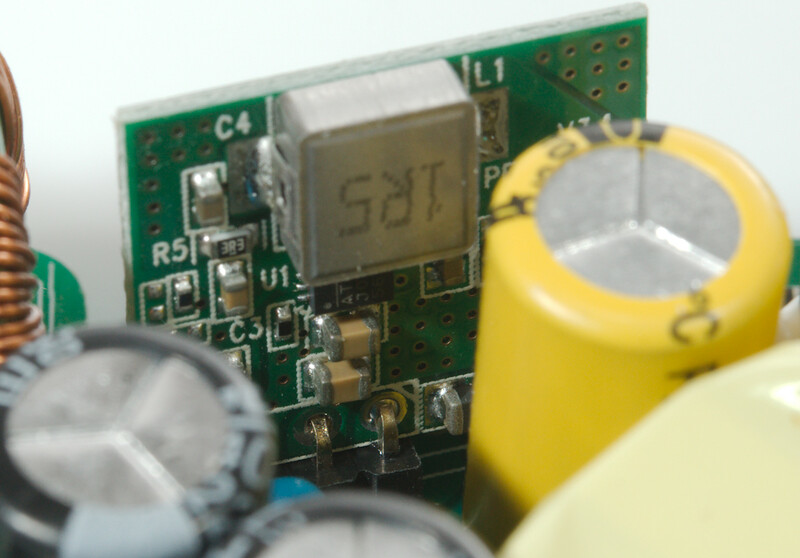 On the low volt side is a USB PD controller (U22: CY2311), the synchronous rectifier transistor (Q20) and a charge optimizer IC for standard USB output. 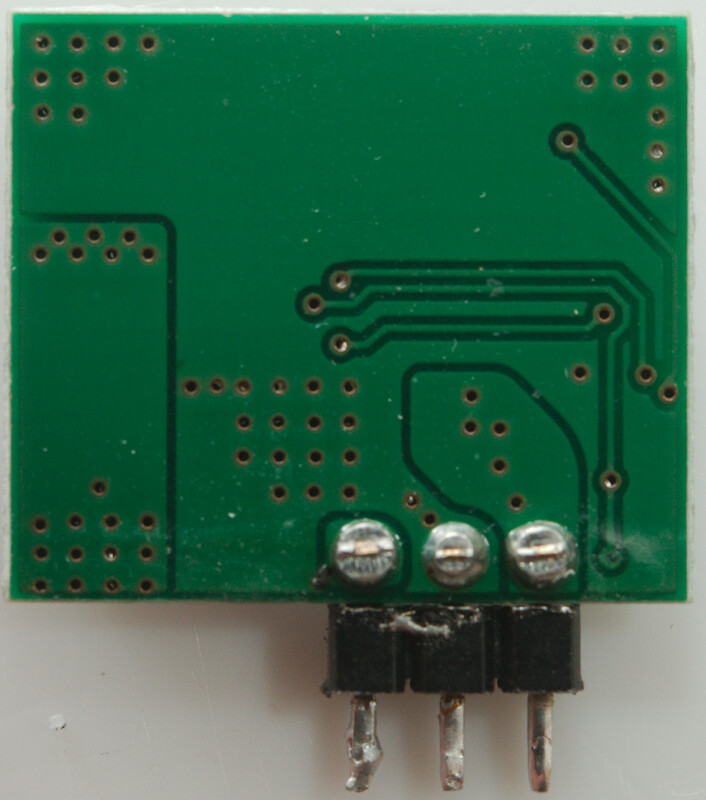 The long opto coupler gives a good isolation distance, but over the slot the distance is slightly low, it is supposed to be 4mm and looks more like 3.5mm, this could have been a problem, but the box has a plastic shield that goes into the slot and secures perfect isolation. 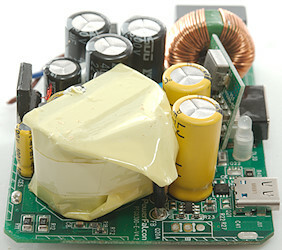 This is an interesting design with only one mains transformer, but it works well. The noise is low, the coding is fine and there is a decent amount of power on both connectors. 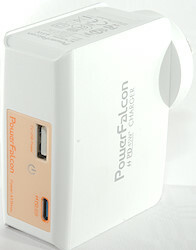 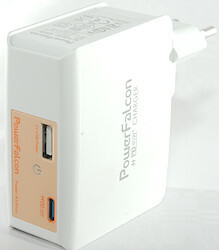 It can charge a laptop and a phone at the same time. 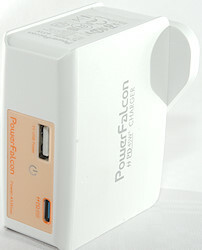 I will call it a good charger. 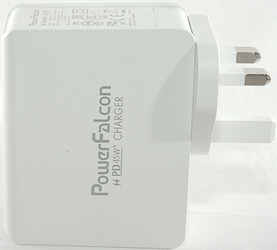 The charger was supplied by a Mostly Melbourne for review. 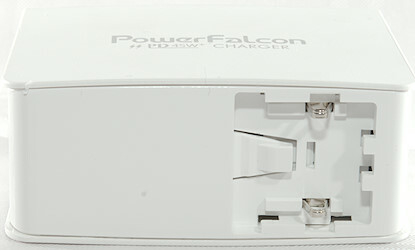 The charger looks great to power the TS100 or the TS80. 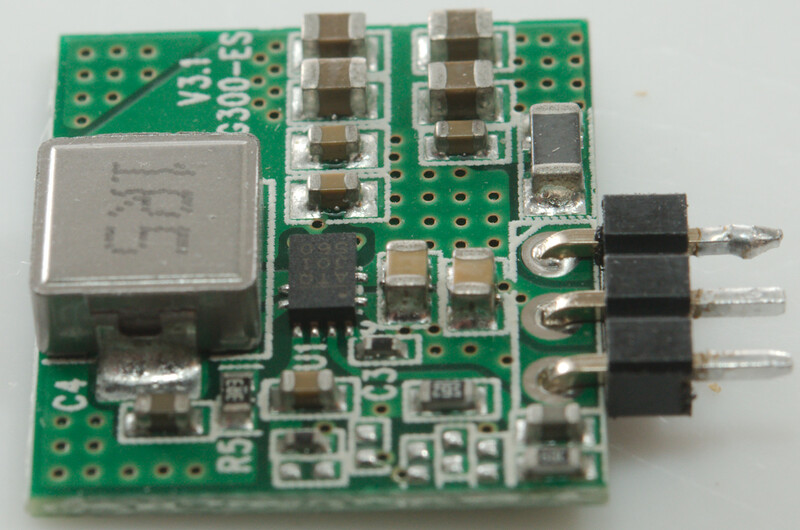 Not really, the ordinary USB output do not have QC, it is only 5V. 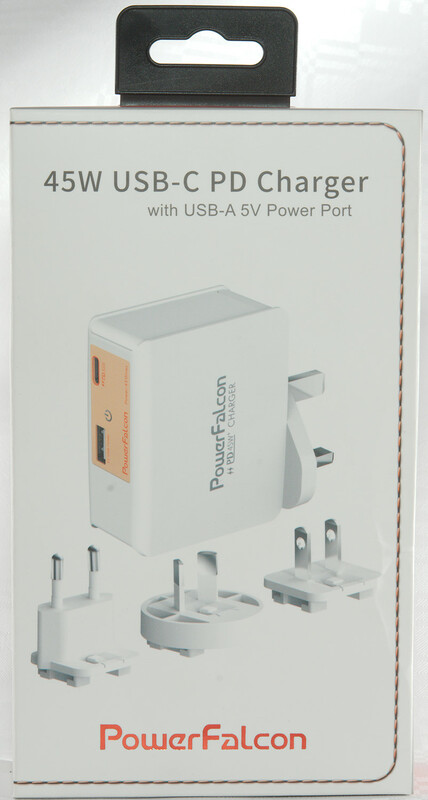 When we get a version with USB-C PD input it will be great. 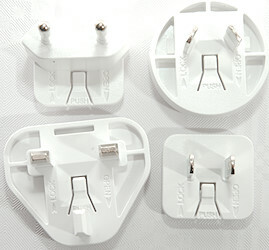 True i didn’t think of that thanks! 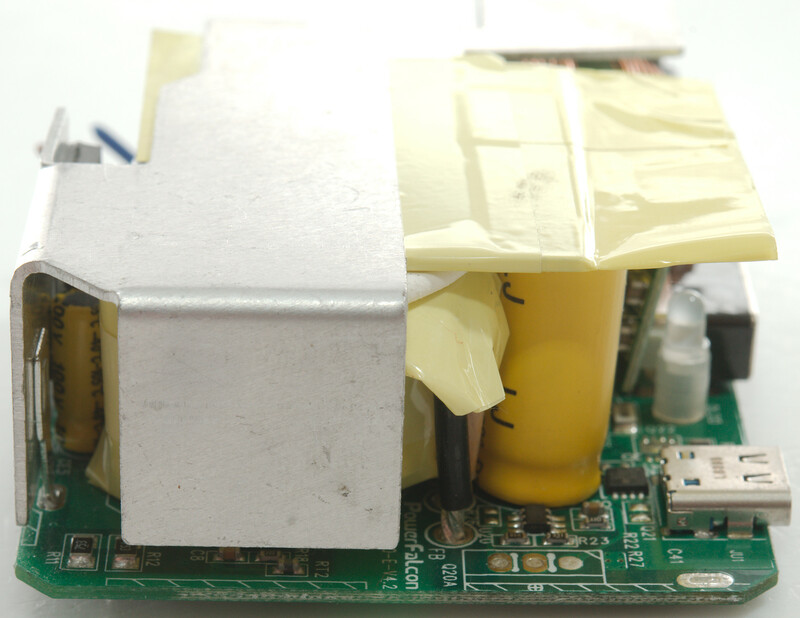 Do you think the TS100 would be able to activate the 20v mode? I am about to buy a TS100. No, you need a PD trigger between. 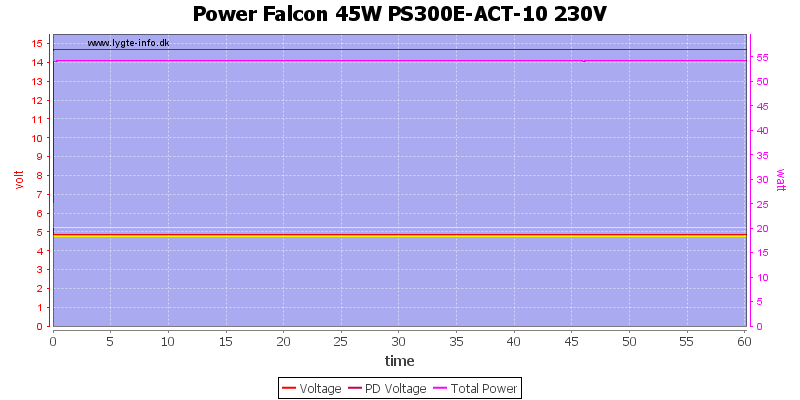 I have a 16v laptop power supply for now but i think i will want more power. 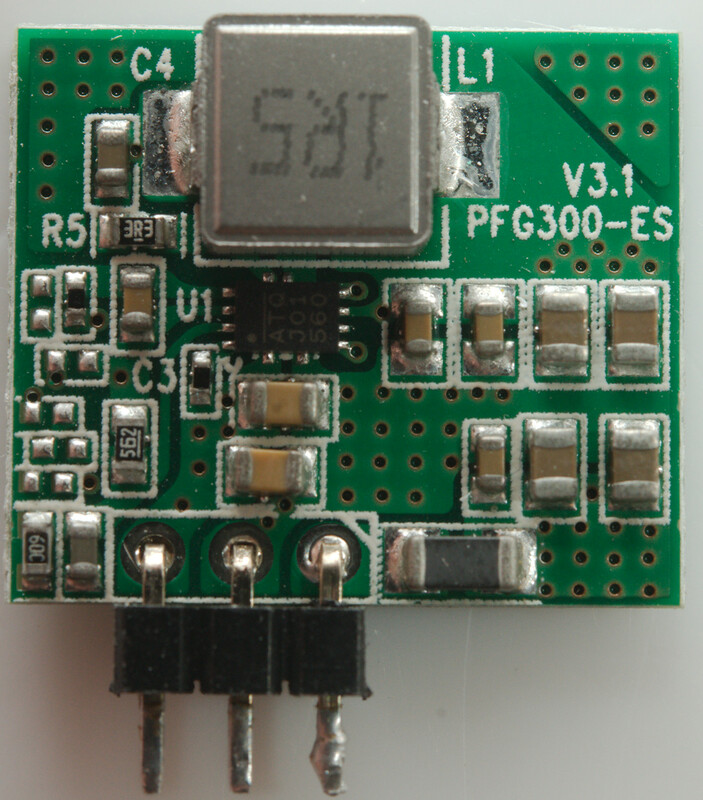 You could write firmware into the TS100 for the PD trigger? It lacks the connections and the TS80 do also. 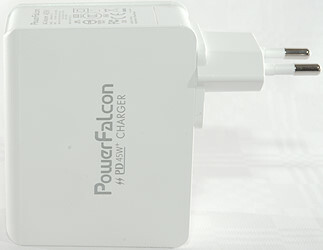 USB-C has an extra data wire for protocol (Not only power) communication. Seems like an awesome idea i can solder in limited spaces by using a USB power supply and the TS100/ TS80 no need for a massive power supply.